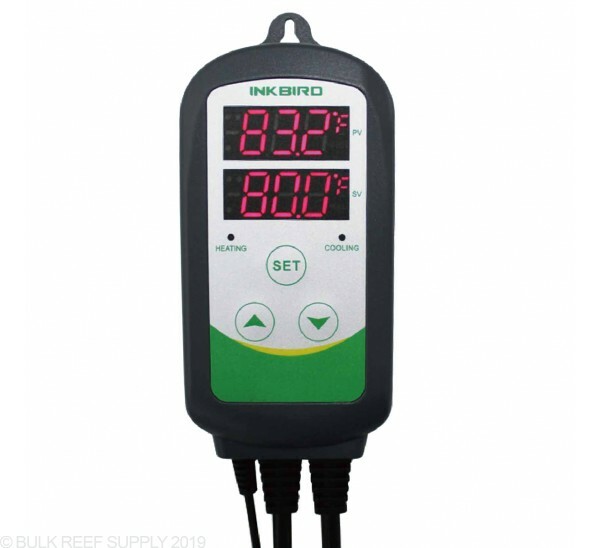 Ink Bird ITC-308 Temperature Controller shows you the current temperature of your aquarium, and also lets you set customized high and low set points to control your tanks heaters and chillers all from a single unit. Heat or cool your tank with the Ink Birds dual control system. One of the biggest issues temperature controllers is the chance that you may be heating and cooling your tank at the same time causing erratic temperature swings and wasted energy. Plug in your heater and chiller into the included sockets and then set your desired temperatures, and the Ink Bird will take care of the rest. 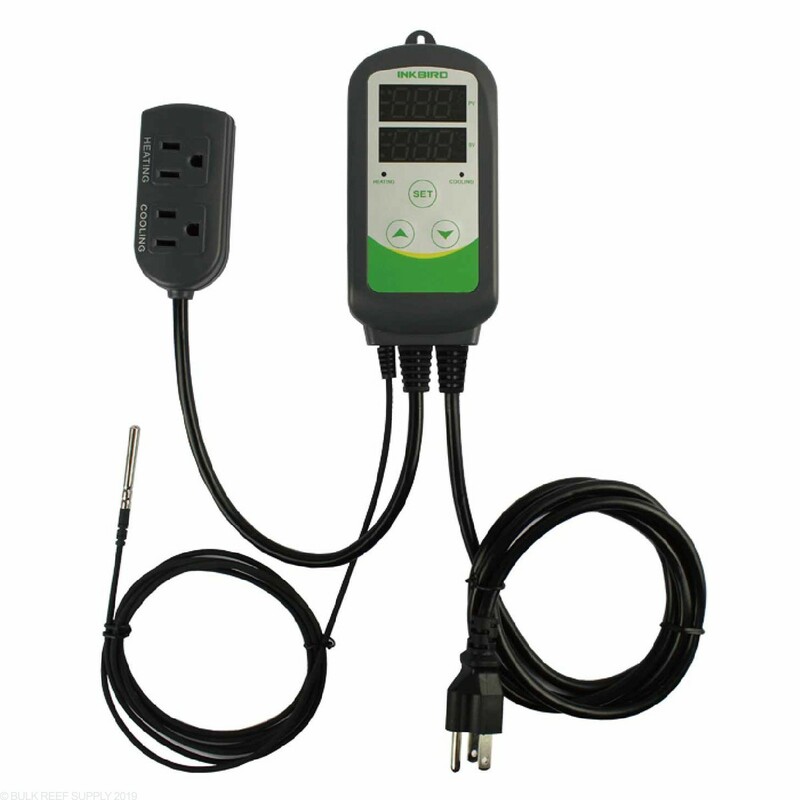 The controller has an audible alarm that will sound if temperatures go over the high or low set point and if the sensor is ever to fault or fail. 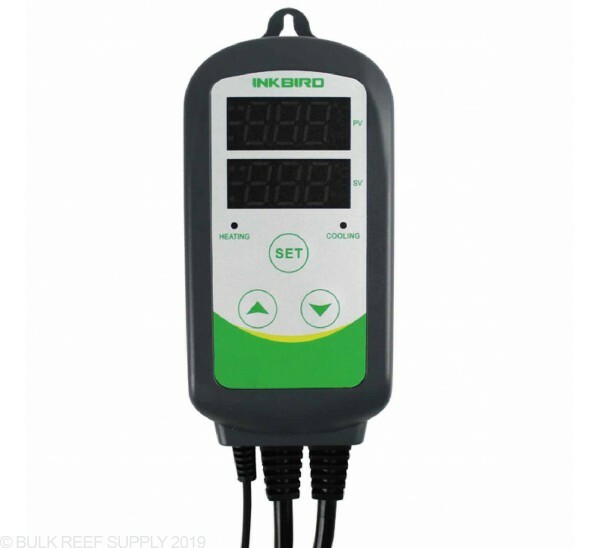 Programming an aquarium temperature controller cannot be made any easier than the Ink Bird ITC-308. Know the temperature of your reef tank, at a glance from across the room. The large LED display lets you see the current temperature along with your desired set temperature that can show readings in Centigrade and Fahrenheit. The controller also comes with LED indicator lights letting you know if the power socket is allowing power to the heater or the chiller. Controller Dimensions - 5.5" x 2.7" x 1.3"
Socket Dimensions - 3.3" x 1.7" x 1.0"
In the dead of winter this thing decided to start reading hot and dropped my temp in my tank to 60 degrees. As of now the probe is still sitting in there because I was hoping inkbird would make it right at least but with a single heater on at 78 the inkbird probe is reading 115. How can something so simple be such poor poor quality? No issues with mine. I have been running mine for a year this month. Calibrated it when I got it, and have not touched it since. I verify temp regularly with a Hanna temp probe. My only gripe, if I would even call it that, is the 1 degree heating/cooling differential. But a lot of other brands are 1 degree also. I like this controller, and it works great for me. Simple to use, without the incredibly ridiculous price tag. The ink bird temperature controller worked good for a few months then went way out of calibration. + - 15 degrees. became junk. I don't understand why the quality just isn't there. Only thing is you have to calibrate every so often other then that have had no issues with it. But with all products you should check your temperatures with a reliable source. Common sense just saying! just 1 month old and now the cooling wont turn off, the temp settings are all correct and the light goes off on the unit as if it should turn off but it just stays on 24/7, company's reply was to send me instructions that came with it on how to set it up which were super unhelpful. After a few months of use I kept getting an over heating alarm. It was reading 9 degrees higher than actual temp. In my efforts to cool what I suspected to be an over heated tank, I basically froze my ten year old colony of sps to death. I trust my ex wife more than I trust this thing. Just as the title says, if you can handle the one degree temperature variance this product is perfect! I do have the temperature probe submerged all the way under water without any problems this far. Bought elsewhere but when you leave the review for other constomers. Had in service on my reef with great stability for four months - probe or connection went bad reading went high, tank got cold (75deg), had to dig out my old RANCO. This thing seems like a really good idea I wish somebody would make something simple and expensive high amp relays like this INKBIRD but better reliability with regards to the probe. dont buy this. bought in may, put in service in august. came home from work, found that my cooling side was on, and it reported that my tank was 83. I stuck my hand in and tested other ways, and the tank had dropped to in the 60s. ive lost several fish, and have since bypassed this controller. No matter what tank i put it in, it reads over 80 and turns on the cooling side. If i cant go to work and trust it to keep my tank at temp then we have a problem. i thew in my glass heaters i have in reserve, and slowly brought temp back up to reduce any shock. Still lost at least 4 fish from the swing. How does the probe hold up to saltwater will it last ? Could this be used to prevent a light fixture from overheating a display tank. I'm considering using this with 4 Hydra 26s, is this possible? 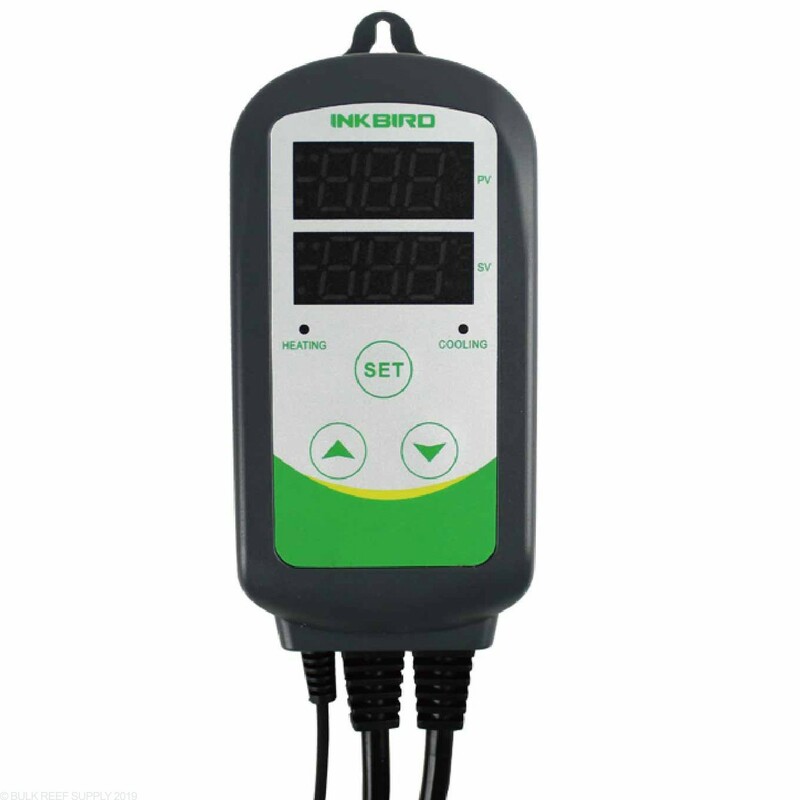 The Ink-Bird Temperature Controller can definitely connect to light fixtures to turn them off when the heat rises to a pre-determined set point. 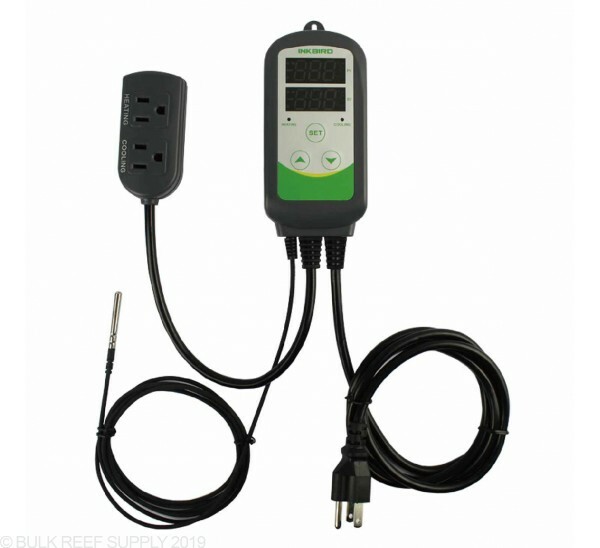 You will want to keep track of how much power you are flowing through the Ink-Bird controller and not overload it. Can this be used to control two heaters (as opposed to one heater and one chiller) and/or would a different controller be better for that purpose? Thanks for reaching out to us. Since this product is both a heating and cooling element, two heaters would not be appropriate for this. Can i use this as a stand alone heater controller? The InkBird would be a great stand-alone heater controller. I have used other temperature controller + eheim jager heater. I've found issues where if I use the heater alone, works fine and I reach the desired temperature, when I plugged the heater into the controller, I never reach to desired temperature, I think this is a mismatch between the heater thermostat and the controller. Can I use this controller with a heater that has a thermostat, more than a control, I want to use this controller as an alarm and just turned off the heater if this is doing something wrong (over-heating my tank for example). Thanks! More than likely the issue you have been running into is a mismatch between the calibrations of the heater and the controller. The nice thing about the Jager heaters is that you can actually calibrate them. 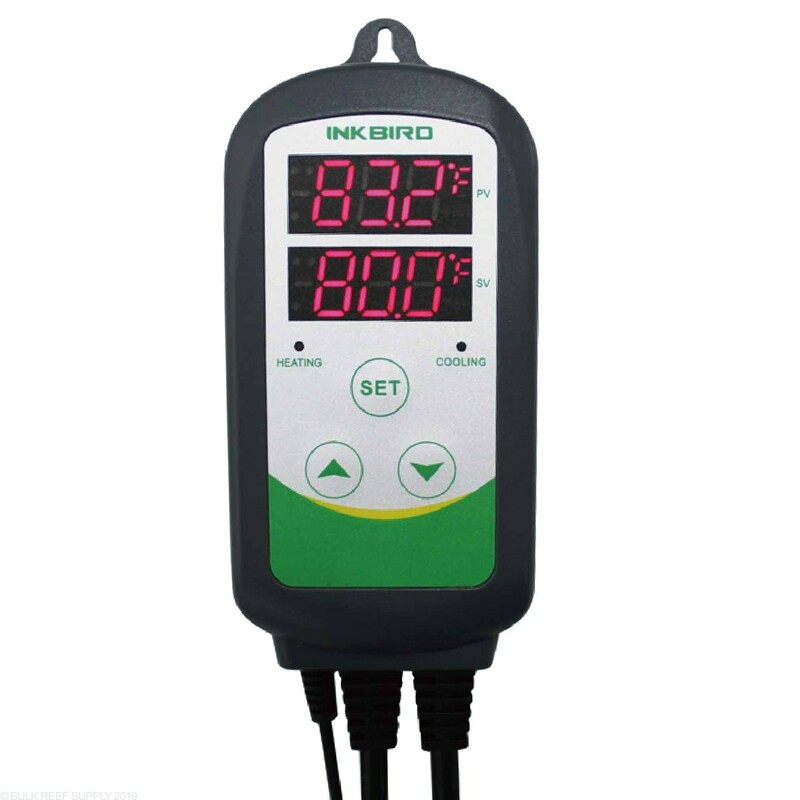 You can use the InkBird controller as a temperature override in case the heater ever gets stuck on. You will most likely want to set the controller a couple of degrees higher, but using it as a fail-safe is the perfect use for it.